Even as the Internet is changing every aspect of our lives and communities, most Americans are intimidated by confusing jargon and misconceptions about Internet policy. We are developing a series of fact sheets that make these issues understandable to everyone. We presently have fact sheets, covering broadband, financing networks, wireless Internet, economic development benefits from community owned networks, and the public savings from community owned networks. 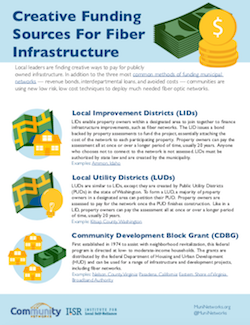 If you want to stay up to date with these fact sheets and other developments in community owned networks, subscribe to our one-email-per-week list. Once a week, we send out an update with new stories and resources. Local governments spend billions on all sorts of infrastructure every year to advance the public good for their communities. Roads and bridges keep day-to-day activity moving. Investments such as water and sewer infrastructure keep cities clean and livable. Fiber infrastructure is used for a wide range of purposes, including economic development, education, and to keep a city’s administration connected. 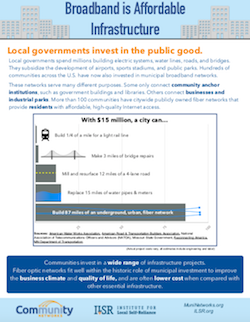 To get a look at how fiber network infrastructure compares to other public investments, we've developed the Broadband is Affordable Infrastructure fact sheet. “This allowed for us to simply add the UTOPIA service to our current provider’s bill and allowed us to avoid the hassle of establishing a new account with a new provider,” Barlow says. We are pleased to announce that an excerpt of our report, Chanute's Gig: One Rural Kansas Community's Tradition of Innovation Led to A Gigabit and Ubiquitous Wireless Coverage, is now highlighted in the newest Broadband Communities Magazine. The November/December 2012 issue focuses on economic development. Editors chose our report because it shows how a community can successfully develop a network to address community needs. The result is greater economic development and a range of increased community benefits. In addition to our report, several other articles focus on economic development and come from authors such as Reed Hundt and Blair Levin, Doug Adams and Michael Curri, Ken Demlow, Craig Settles, and David Moore. You can access the digital edition online and see the entire issue table of contents at Broadband Communities Magazine Online. You can still download the full report from the ILSR website and check out some of our other resources including case studies, fact sheets, video and audio. Cottage Grove, Oregon, is on the cusp of adding up to 250 new jobs with the aid of its fiber optic network. A recent Register-Guard.com article by Serena Markstrom details the potential project between the City and First Call Resolution. The company is interested in expanding to a Cottage Grove shopping strip. While the space is the right size and location, it does not have the needed telecommunications connections for a high-capacity call center. The City is looking into expanding its fiber optic network to accommodate First Call. City leaders will seek a state economic development grant and recently approved funding for an engineer's construction plan to lay the cable to get an accurate cost estimate. Initial estimates are $450,000 for an entire underground installation. Council members have already suggested that the expansion makes sense, regardless of whether or not First Call becomes a tenant. The 7 miles of fiber are primarily located in the southern part of the city while the shopping strip is in the north. If more businesses moved in and started leasing the cable, the city could collect money — just like any utility — from those who tapped into the network and use those funds to continue to expand fiber optic cable around town, Meyers said. Kudos to Richard Downey, Village Administrator for the Village of Kronenwetter in Wisconsin. Mr. Downey reminded us that we have yet to write about the fiber network in Princeton, Illinois. While we have noted Princeton in our list of economic development successes, we haven't delved into the network that serves the city, the schools, and the business community. Princeton is home to about 7,500 people and is located in the north central region of the state in Bureau County. They have their own electric, water, and wastewater utilities and began offering broadband connectivity in late 2003. We spoke with Jason Bird, Superintendent of Princeton Electric Department, who shared the network's story with us. In 2003, the city’s largest electric and water consumer was also the largest employer. At the time, incumbents served the community with T1 connections. The manufacturing company moved to Mexico, taking 450 jobs with it. The community was stunned. Approximately 6 months later, Ingersoll Rand, the community's second largest employer with about 300 jobs, also considered moving away from Princeton. While lack of needed broadband was not the only reason, the Ingersoll Rand CEO let community leaders know that it was one of the influential factors. The company liked being in Princeton, and the city would have been on the top of the location list if not for the sad state of connectivity. At the time, the only commercial option was unreliable T1 connections for $1,500 - $2,000 per month. If Ingersoll Rand moved, the community would experience job losses equal to 10% of the population. Community leaders needed to act and do it quickly. As I recently mentioned in my endorsement of Tubes by Andrew Blum, the book explains how a municipal fiber network helped to attract Google to town. Google sited its first "built-from-scratch data center" there, a $600 million investment according to Stephen Levy. According to Blum, it all started back in 2000 when the community got fed up with incumbent telephone company Sprint. The Dalles was suffering economically due to its reliance on industrial jobs that were slowly disappearing. "We said, 'That's not quick enough for us! We'll do it ourselves,'" Young recalled. It was an act of both faith and desperation--the ultimate "if you build it they will come" move. In 2002, the Quality Life Broadband Network, or "Q-Life" was chartered as an independent utility, with local hospitals and schools as its first customers. Construction began on a seventeen mile fiber loop around The Dalles, from city hall to a hub at the BPA's Big Eddy substation, on the outskirts of town. Its total cost was $1.8 million, funded half with federal and state grants, and half with a loan. No city funds were used. ... Once Q-Life's fiber was in place, local Internet service providers quickly swooped in to offer the services Sprint wouldn't. Six months later, Sprint itself even showed up--quite a lot sooner than its original five-year timeline. "We count that as one of our successes," Young said. "One could say that they're our competitors, but now there were options." But the town couldn't have predicted what happened next. At the time, few could have. The Dalles was about to become home to the world's most famous data center. Following the collapse of key industries, a town of 50,000 in eastern North Carolina had to make a hard choice. It wanted to support existing businesses and attract new ones but the cable and telephone companies were not interested in upgrading their networks for cutting edge capacity. So Wilson decided to build its own fiber optic network, now one of the fastest in the nation, earning praise from local businesses that have a new edge over competitors in the digital economy. In response, Time Warner Cable lowered its prices and modestly boosted available Internet speeds, contributing to the $1 million saved by the community each year. Download Carolina's Connected Community: Wilson Gives Greenlight to Fast Internet here. The Institute for Local Self-Reliance and Common Cause have just released a case study of how and why Wilson built Greenlight, a citywide next-generation fiber-to-the-home network that set the standard for connectivity in North Carolina. The report is authored by Todd O'Boyle of Common Cause and Christopher Mitchell of the Institute for Local Self-Reliance. The network, owned and operated by the municipal utility, offer telephone, television, and Internet services to every resident or business in the city. Over 6,000 households and businesses have subscribed, a take rate of over 30% and growing. Additionally, the network has connected all of the schools with at least 100 Mbps connections. Downtown has free Wi-Fi and the library has benefited with a higher capacity connection for people looking for jobs and taking computer classes. The Federal Communications Commission ranks North Carolina last in the nation in percentage of households subscribing to at least a "basic broadband" service, largely because Time Warner Cable, CenturyLink, and AT&T have declined to upgrade their networks to modern standards. Only 13% subscribe to a connection that is at least 4 Mbps downstream and 1 Mbps upstream -- the minimum required to take advantage of basic Internet applications according to the FCC. This story was originally posted on the ILSR website. Dr Browder runs Bristol Tennessee Essential Services, the municipal utility on the southern side of Bristol's Virginia border. For our 24th Community Broadband Bits podcast, he tells us how they built a FTTH network and how it has helped the community. Like so many others, they started by seeking to ensure maximum reliability of the electrical grid. Now they offer telephone, television, and Internet access to the whole community. In fact, they just announced that they can offer a gigabit to anyone in the area, making them the fifth such city in America to have that level of service available. All of them are community networks. One of the things Dr. Browder explains is how connecting all their schools with 100 Mbps and 1 Gbps connections has led to stronger schools and new opportunities for kids to learn. This show is 20 minutes long and can be played below on this page or subscribe via iTunes or via the tool of your choice using this feed. Search for us in iTunes and leave a positive comment! A recent article and video from Government Technology highlights the ambitious plans of Raleigh to harness the Internet to improve its attractiveness to forward-looking companies. Unfortunately, Time Warner Cable convinced North Carolina's legislature that communities could not be trusted with the decision over whether it was a wise decision to invest in telecommunications networks. So despite Raleigh's smart plans to build a fiber optic infrastructure that could be used to connect local businesses and spur new enterprises, it is prohibited from doing so. It can still offer services for free, which is why it can and does offer free Wi-Fi in some areas of town, but it cannot offer the services that would be most beneficial to the kind of companies that are most drawn to the Research Triangle Park area. We look forward to a North Carolina that recognizes these decisions should be made at the local level, not by lobbyists working the state or federal capitals. But until then, we'll have to celebrate the jobs created by municipal networks in other states, where communities have the power to determine their own digital futures. While I was in Danville, Virginia, for the Broadband Community Magazine Economic Development Conference, I had a chance to sit down with Jason Grey, nDanville Network Manager. This interview is our 22nd episode of the Community Broadband Bits podcast. Jason and I met five years ago when I first visited Danville to learn about its municipal open access fiber-optic network. Danville is located in southern Virginia and was hit hard by the demise of tobacco and the loss of manufacturing jobs. But the municipal utility loaned itself enough capital to build a fiber network connecting the schools -- by provisioning its own service, they were able to pay back the loan, make contributions to the general fund, and still have enough money left over to expand the network to connect local businesses. The network has been a tremendous success, attracting new employers and helping existing businesses to expand. And the network is just starting to connect residents in a few neighborhoods. Read our stories about nDanville. This show is 15 minutes long and can be played below on this page or subscribe via iTunes or via the tool of your choice using this feed. Search for us in iTunes and leave a positive comment!